'COLDWIND Pro' The established standard for the Refrigeration Industry. Used by leading refrigeration companies throughout the world for coldroom refrigeration load calculations and reports. Faster than so called 'quick selection charts' and infinitely more accurate. Click image for next screen sample. Click here to switch to Imperial units. Compute refrigeration loads, in either Imperial or SI units, for projects drawn directly on-screen, with any number of walls, arranged at any angles and with any mix of insulation materials. Automatic & correctly weighted energy profiling at hourly intervals for every day of the year! Large product database and many new features including:- pitched roof option; in-situ sprayed foam polyurethane insulation; refrigerated containers, trucks and vans; blast freezers and blast chillers; 'Grid-size' cold rooms; 'context sensitive' help pages; 'cue' cards; bar graphs and pie charts; conventional 'Windows system' calculation filing, file retrieval and colour printing routines; browse facilities and long file names; superb quality report summaries. Will deal with any number of rooms at a time, organised into any number of zones & located anywhere in the world. 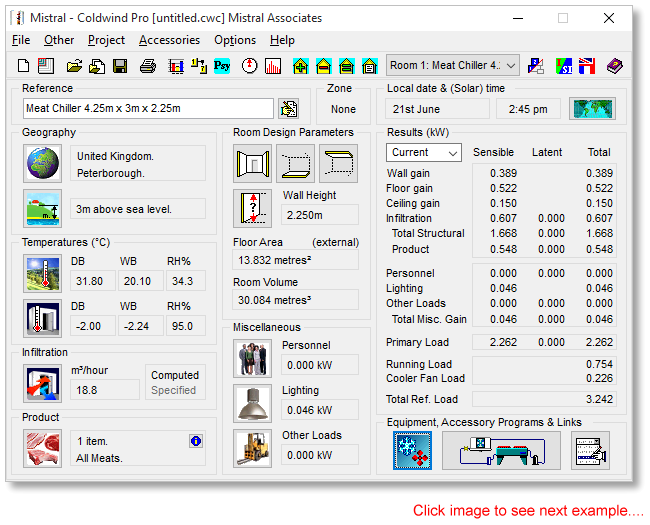 'COLDWIND Pro' automatically links to supplied comprehensive refrigeration equipment selection engines that select and balance optimum capital equipment from all significant cooler, condenser, condensing unit, compressor, packaged unit, refrigerant and valve maunufacturers. More than 17,000 constantly maintained and independantly checked comprehensive databases and associated drawing and photo image files. A truly awesome program suite that even blue chip companies find impossible to either imitate or emulate. Probably the easiest to use and yet most powerful program of its type in the world. We have certainly never found anything that comes even close. Simply unassailable. If you eat food then Mistral software was used to help refrigerate it! Click to try it!